If you are looking for ideas about how to cook tofu, or are introducing yourself to this versatile vegetarian protein, have a close look at this recipe. We usually associate tofu with Asian recipes, and there are certainly lots of options there, as Asian cuisines use tofu regularly. 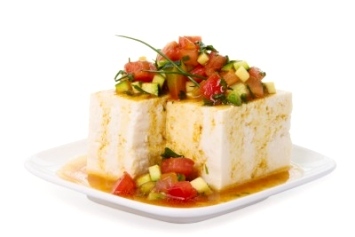 It is a Mediterranean style tofu recipe that combines firm tofu with onions, bell peppers, garlic, zucchini and tomatoes in a stew. In a nonstick skillet heat the oil. Add the onions and saute about 5 minutes or until they are just lightly brown. Add the red pepper and saute 2 to 3 minutes or until it begins to soften. Add garlic and saute for 30 seconds. Stir in the zucchini and thyme. Saute 4 to 5 minutes or until lightly browned. Stir in the tomatoes. Reduce the heat and simmer, partially covered, for 10 minutes, stirring the mixture occasionally. Stir in the chunks of tofu and season with salt and pepper. Simmer, uncovered, about 5 minutes longer or until heated through. Stir in the fresh chopped basil just before serving. The image above shows an alternate serving suggestion. Instead of slicing the vegetables, cut them into a small dice. Leave the tofu whole or slice the block into thick slices and heat through in the sauce. Place the whole tofu or tofu slices on a serving plate, then pour the sauce over it. Tofu comes in three consistencies: soft, medium and firm. This recipe uses the firm variety. Cooking tofu is quick and easy, as it is basically ready to eat in the container. Because it is such a bland food, it needs other ingredients and flavorings to make it tasty. This dish adds the flavors of the Mediterranean, both in the vegetables used as well as the herbs that flavor the dish. I love easy dinner recipes, but often think that vegetarian recipes won’t be quick to make. Not so. This fabulous vegetarian recipe is ready in under 30 minutes from start to finish. Don’t like tofu? You can do two things: Leave it out and serve this as a great tasting vegetarian side dish or add chopped chicken breast and turn it into a Mediterranean style chicken stew. I think that even if you are not interested in becoming a vegetarian, it can’t hurt us to eat a few vegetarian meals once in a while, so I wouldn’t add the meat. Of course, the choice is always yours. Either way, I think you will enjoy the flavor of this healthy dinner recipe. This is a wonderful diabetic recipe. It is also gluten free and fairly low carb, considering it is a meal in itself. If you like this recipe, I’d love you to Pin it to Pinterest, Tweet about it, Like it on Facebook and add your own favorite recipes below. Look here for how to cook tofu Asian style in a spicy stir fry.